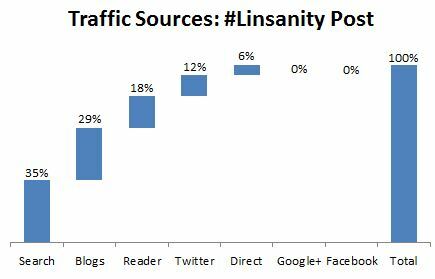 With my recent post on #Linsanity, I did a test to see how much traffic various social networks generated. Specifically, I wanted to see if there was any value to posting a link on Google+. I posted a link to my post on the three major Social Networks: Facebook, Twitter, and Google Plus to see which would drive the most traffic. Facebook didn’t generate any visits. For most posts, I usually see a trickle of traffic from Facebook, but I was surprised none of my “friends” bothered to click the link. I got a surprising amount of traffic from other blogs. I had previously underestimated this traffic. Google Reader still delivers. Even though Google has been trying to downplay Google Reader and remove the sharing functionality, and even though I post my full feed on RSS, people still click through. Note: Subscribe to my blog and don’t miss anything! Cut and paste this link in your RSS reader of choice. I’ll run another test in a few months and see if anything has changed. For now, I will continue using Google+ exactly like I have in the past: Not at all.